Last month I’d briefly mentioned that Highland Secondary School was doing an amazing job of raising funds for The Creation of Hope. This school, under the direction of Crystal Dumitru, Patti Haygarth and Jennifer Lewis-Lawson, have initiated a wide range and variety of activities to raise money. These included a grade 11 Mime Show ($176.50); a Day without Desks ($434.01) in which students had to buy back the essentials in their classes such as lights, desks, computers; a Diversity Luncheon ($472.10) where students cooked dishes from their cultural roots and hosted the lunch; 24 Hour Day of Silence ($5472.71) where students collected pledges and vowed not to speak to symbolize the ‘voices’ of other people in the world who need help; and finally, an incredible evening event, Connect-4-Hope (which raised an additional $1010.00). The inception of their involvement is described below. In total Highland Secondary raised $7566.32! Last May, a group of Highland Secondary School students from Dundas, Ontario went to a We Day training session where they got inspired to create change in the world. They came away from the training wanting not only to raise money for people in need, but also to educate their community about global issues. After many brainstorming and planning sessions, CONNECT-4-HOPE was born. The students chose Creation of Hope to be their charity. With the new Highland program, Global CONNECT, in mind, they named their baby. CONNECT-4-HOPE was an ambitious project that got many clubs and organizations on the school campus involved – the original group of students became the steering committee, and they enlisted the help of the Visual Arts Council, the World Awareness Committee, the Musical Arts Council, the Student Council, Haven (a human rights organization), and the Drama Student Federation. Why did they involve so many students? It was easy – they wanted to inspire them to participate in change and they needed their help to create their vision! In the end, CONNECT-4-HOPE was an entertaining and educational evening for the whole community. The students began with a video about Creation of Hope to educate the audience about the charity and the children of Kikima. Anita Walters was able to attend to represent Creation of Hope, and she brought a text message from Eric, which was very touching. There were two major “acts” during the evening: the first was a sweatshop-free, eco-friendly fashion show, and the second was a musical coffee house featuring students performing tunes with social justice or environmentally-friendly lyrics. The fashion show featured clothing from American Apparel and a local shop that sells sweatshop-free attire. The two scenes that stole the show featured the designs of Highland’s own art students – one scene showed off clothing made from recycled objects such as kool-aid containers and rubber gloves – the other portrayed Highland students’ styles using recycled clothing. Between the two acts, the audience enjoyed the most eco-friendly, fair trade coffee on the market, and they browsed booths set up with community vendors who specialize in locally-created and eco-friendly products. The coffeehouse featured music ranging from an acoustical version of Bob Marley’s “Redemption Song” to original music focused on our abuse of the environment. All-in-all, CONNECT-4-HOPE was very entertaining, educational and a great way to raise money for Kikima’s community. In total, the evening raised $876.71. When this was added to some previous donations, Highland cut a cheque for $1010.00. Highland students were very proud to see their efforts pay off in so many ways. Quite frankly, I find myself at a loss as to how to thank these teachers and students. They raised an incredible amount of money but also provided education, conscience-raising and life changing events for students while providing us all with a model that other schools could follow. From myself, my family, and most importantly, the people of Kikima, I offer my heart-felt thank you. You have changed lives, here and in Kenya, and saved lives in Kenya. Veronika Vistica and her Grade 3 class at St. John The Baptist in Bolton donated $80.00 to purchase 2 goats. They will receive pictures when these have been given to orphans – Ruth has said this will take place before the end of May so hopefully you’ll all see these goats in the May update! Leah Broadfoot is a young lady from Kingston who attends Calvin Park School. She raised $110.00. Below is a letter that accompanied her donation. My name is Leah Broadfoot. In February I challenged myself to raise money for The Creation of Hope. I emailed Eric Walters at the beginning of my project saying how important it was to make sure people across the world help each other, and help other people who are less fortunate. I read on his website that you can choose what you want the money to go towards for example, buying a blanket, a solar cooker, a goat, et cetera. However, it is also suggested that I let the staff decide because they know what Kikima needs. I will choose this, because I know I may choose something that Kikima doesn’t need as much as something else. I do hope this amount of money will give an orphan, or a family, hope and light. Leah is a pretty impressive young lady. Thank you, Leah! We have instantly put Leah’s money to work. The children of Rolling Hills Residence require school supplies on an ongoing basis. While school is free until the end of grade 8 they must provide their own text books, pens and paper and all school supplies. We used $92.00 of Leah’s money to provide supplies. The other $18.00 went towards an expense of $573.00 that provided text books for the children of Rolling Hills and Exodus as they started their new school year. The remaining $555.00 was provided by the students of Medicine Hat High School. With these text books the students are equipped with what they need to get the best possible results this school year. Usborne Central School raised $200.00. This money was used to provide $91.00 for shoes for children in the program and to fund a Mentorship program at Exodus for $108.00 which helped train the Exodus children to become mentors to others in their community. Part of the message that Elijah has been providing for the orphans of Exodus is that they are not only the recipients of help but have an obligation to help others in their community. This is a powerful message that these young people are capable, strong, able, and have things to give – a message of empowerment. Educating people in the community – seminars – continues to be part of our mandate in the community. Ruth held workshops on the importance of helping the needy within the community. The cost of bringing in speakers and providing food for these seminars was $360.00. The results have already brought results with local people coming forward with food, supplies, sponsorship and a promise of donating bricks and windows for our next expansion. Ruth, thanks for helping to change a community. The funds for these seminars were provided by money raised by Robert Southey School. In Canada we are so fortunate that our medical treatment is provided. In Kenya this is not the case. With over two hundred and fifty children being involved with the program (Rolling Hills residents, Exodus residents, sponsored children in the community and their siblings) there is always somebody who requires medical treatment. The cost of medical treatment and medication (many kids needed ringworm medication) was $197.00 and was provided by three sources – $50.00 from Elissa and Rosie, $51.43 from Mrs. Currie’s art class, and the remaining $95.57 from Fairview Public School. In addition we have used money from Fairview to purchase towels and basins ($57.00), stationary ($85.00) and umbrellas ($45.00). Those who follow our website are familiar with Sarah Nzilani and her brother Mwongela. They came from a very desperate situation and took up residence at Exodus last year. They were both remarkable students who finished first in Grade 8 and Grade 4 respectively. In fact the headmaster said they were about the two brightest students he had ever met in his time as an educator. Sarah did incredibly well in the national grade 8 exams – which determine if you can go on to high school and which ‘level’ of high school you can attend. Her results, as expected, were remarkable. She qualified for not just the local school but a higher level school. The problem – a higher level of school cost more money (high school is not free in Kenya). We made a decision that she deserved the best. The cost of her school – tuition and residence – is $462.00. This money was provided by funds raised by Alexander Graham Bell Public School. The wonderful students of that school are making it possible for Sarah to become all that she can be. Education is a major goal for all of our children. The path out of poverty and toward long-term stability and happiness for our children rests in their ability to get a good education. Many of the children at Rolling Hills had missed many days of school prior to entering our residence because their family couldn’t afford fees, they had to stay out of school to work to support themselves or they couldn’t afford tests or text books. We decided that we needed to help provide them with additional help. We hired a tutor for it would benefit all the children of Rolling Hills Residence if they were given additional instruction after school – tutoring. A teacher has been working with the children to improve their grades. The cost of this tutoring is $260.00. Once again we have drawn on funds from Alexander Graham Bell – a school where the teachers encourage students to work to become the most they can be. Those AGB students are helping others students reach their goals as well. Matron’s salary – once again we used money donated by Innisdale to pay the $100.00 salary of the matron. Food Distribution – as always every two weeks we provide food to needy children and their extended families throughout Mbooni. 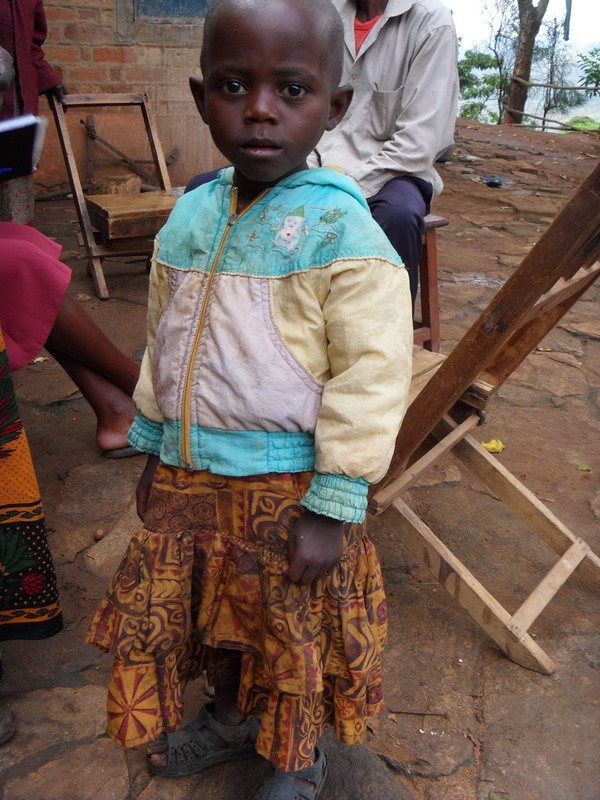 Much of the money needed is provided by sponsorship of children but there is always a shortfall. This month is was $125.00 and this was provided by money donated by Innisdale. Sir Samuel Steele had donated $217.00 of which we had used $150.00 to pay for food distribution for March. We have now used the remaining money to purchase five blankets, a mattress and bed covers for children at Rolling Hills residence. Mbooni district, in which Kikima is located, has just under 25,000 people spread out in a number of towns, villages, smaller clusters and individual homesteads. 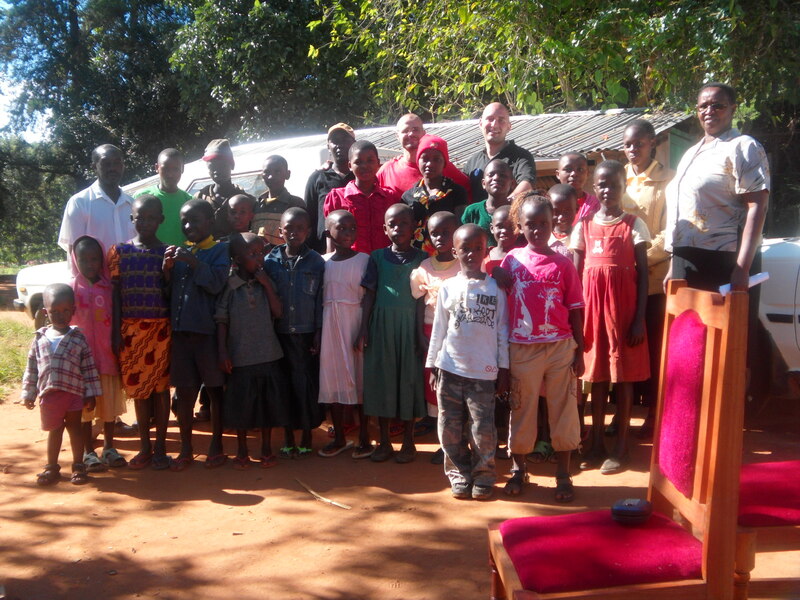 Through our contacts on the ground, which include members of churches and community activists throughout the district, we have always had a good awareness of the needs of orphans throughout the community. However, we decided we needed to have a greater more detailed awareness. By doing this we could identify those individuals who were most needy and thus provide service for them as a priority. The results of this survey are shown in the ‘Needing Sponsorship’ section and in wish lists on the website and will continue to list new children as these are sponsored. As well we were able to identify areas in which water projects would be most welcome, most feasible, and most effective. Completing this survey was a great deal of work and required a salary and expenses such as paying for gas, and shared meals with community members – the sharing of a meal is an important part of the process. The cost for this survey was $385.00. This was funded with $24.00 from students at Ruth Thompson Middle School, $152.00 from Alexander Graham Bell, $73.00 from Robert Southey, and $136.00 from Aldergrove P.S. Those who have been following along know all about Rumsby’s Kids Goat Academy. This building houses the goats and rabbits that provide a stable food source for the children as well as providing goats and rabbits for children in the community. In addition we have talked about establishing a chicken coop. All of these animals require food. During plentiful times this can be gathered from the farm and the neighbouring open spaces. During drought times this food would need to be purchased at a great expense – an expense that would have to be covered from somewhere. Instead, as part of our belief that we should aim for self-sufficiency, we decided to create a storage facility for food for the animals. Originally $318.00 was taken from funds raised by our good friends in Cupar School for this structure. What we discovered was that we needed a much more extensive building. This expansion ended up costing $1034.00 and was broken down by receipts that included bricks, beams, cement, nails, sheets of metal and all labour costs. As always Ruth and Henry were incredibly precise. Now we have a facility that can provide the food that provides for the animals of Rolling Hills Residence. We used $230.00 from money donated by Emily Plewes, $240.00 from funds donated by Aldergrove P.S., and finally $246.00 from money raised by Highland Secondary School in Dundas. In honour of the students in Saskatchewan who who have contributed to our program this building is now known as the Cupar/Robert Southey Structure and a sign will soon be placed on the building and forwarded to those two schools. Many schools and individuals have donated money, which we have been accounting for in the ongoing updates. At the end of this month we still are ‘holding’ these funds. Ray Lewis Public School – we previously spent $500 for school supplies for the community school but we still have $544.00 which is being invested in the development of the Christena Gay Library – soon to be opened. 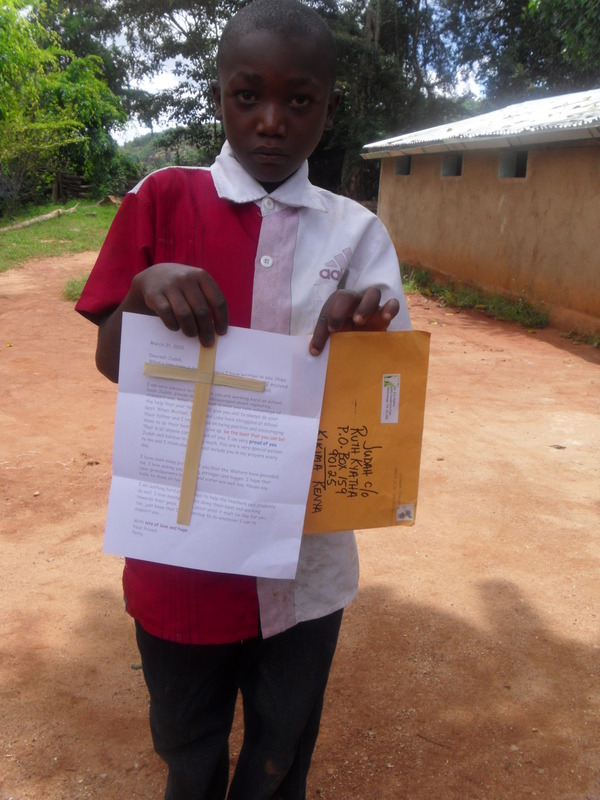 We encourage sponsors to send e-mails and letters and small parcels to their sponsored children. Here’s Judah receiving a parcel from his sponsors. In Kay’s report, at the bottom of the update, regarding newly sponsored children and newly granted wish lists you’ll read more, but I just wanted to drop in a picture here. We try to get back a picture of wish lists being granted to the person who funded that wish list. Here’s a picture of Kitoo receiving part of his wish list. Anybody reading this who wishes to help provide for funds for the granting of a wish list or who would want more information about becoming a sponsor can either contact me or Kay to learn more. Sponsorship can be for as little as $30.00 per month or up to $60.00 per month and we encourage e-mail contact, letters and even small parcels to be sent and exchanged. The expansion of our sponsorship program is becoming the backbone of our program along with school involvement. Lorraine, a ceaseless givers, granted Maundu Mwanza and Ndinda Mwanza’s wish lists in memory of Tom and Bea Toma who demonstrated during their lives that “you must help those less fortunate“. She also provided funds for a goat to be purchased. Vivien Canning granted Teddy Mutua’s and Muthoka Muendi’s wish lists. Marina Cohen’s aunt, Ursula Balas, granted Kitoo Kariuki’s wish list with her $100 donation. Emily Plewes granted Mutinda Mativo’s wishlist. Laurie and Nick Finlayson granted two wishlists, Mutie Luka’s and Yula Kala’s. Ruth Murdock also granted a wish list for Miriam Ndanu. We also got some unexpected visitors who heard about us and decided to pass by. 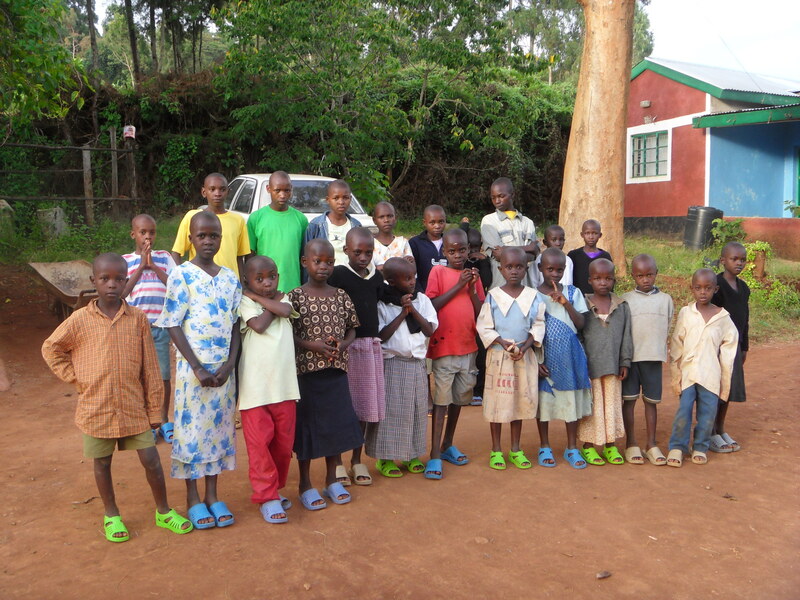 They left us with some money that we used to buy the Hope children slippers (24 pairs!). Thank you Enzo, Ernest and team. Leonard Muthama John is 8 years old, his exact date of birth is not known. He is in standard 1. His mother passed away in 2008 and his father in 2009, both from malaria. His elder brother who is 18 years old is in mechanical school, leaving the second born, 15 year old Kalekye as the head of the family. 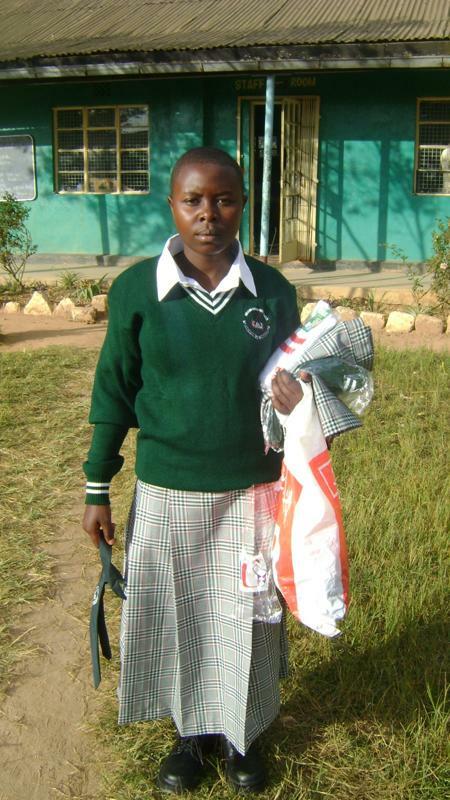 She did her National Exam for Class 8 last year but is unable to continue to high school due to lack of fees. 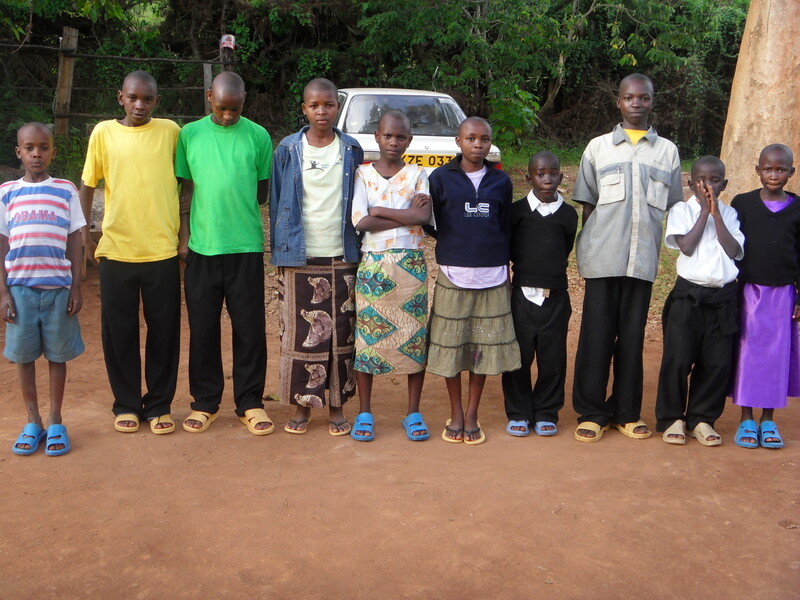 They also live with 13 year old Mwende who is in Class 8, 12 year old Maundu who is in Class 5, 10 year old Vaati who is in Class 5 and 5 year old Katiwa who is in Nursery. Kalekye fetches firewood and water which she sells to her neighbours to get money to sustain the family. Sometimes well wishers or the church help her out. Leonard confessed that he doesn’t feel like going on with school because should he go up to class 8, he will not have the money to go on to high school, just like his sister. He should just help his sister to make some money. 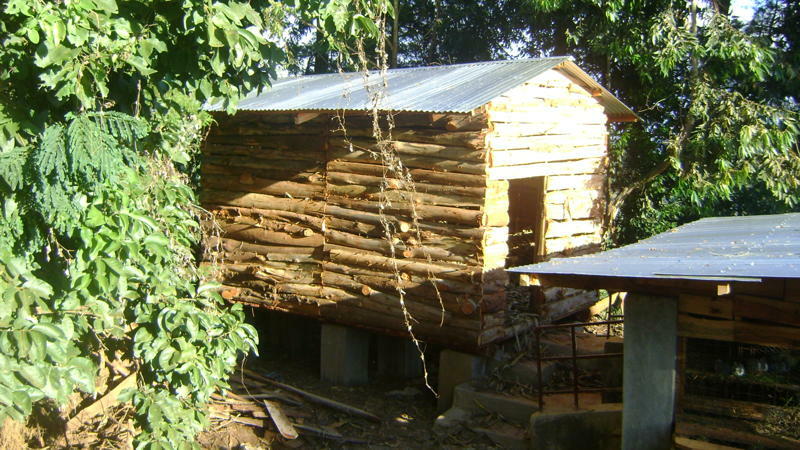 They live in a mud and iron sheet roofed house that is just a single room. All the children sleep there, with 4 of them in one bed. It has a mattress and 2 blankets and 2 sheets but they are all old, dirty and torn. 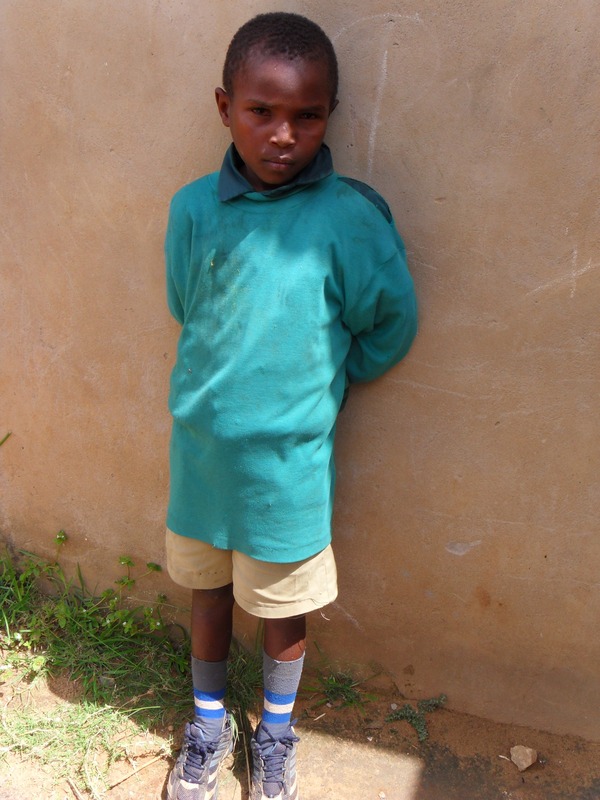 His wish list includes food, clothes, beddings, stationery, textbooks, a bed, a house, education, paraffin and soap. This was fulfilled by Lynda Martin, who also sponsored him and paid for his sister to go to high school. She also generously offered to buy ringworm medicine for any of our identified children who need it. Nduku Mbula was born on 21st October, 2004. She is 5 ½ years old and in nursery school. She lives with her 91 year old grandfather, 85+ year old grandmother, her aunt and uncle and their 5 children and her 4 siblings. 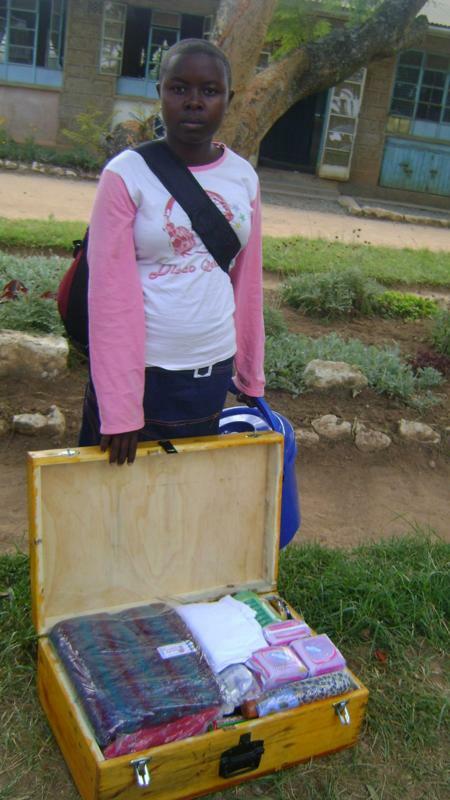 Her mother used to work in Nairobi as a tailor but she was HIV+ and when her health deteriorated, she moved back into her parents’ house where she died a month later, in August 2009. She was not married. Her grandfather is a retired teacher and supports his family through his pension. Her uncle is a carpenter and supplements her grandfather’s income. They have a 3 acre piece of land on which they grow maize and mangoes. Sometimes they grow vegetables through irrigation, but only when the water is available. They also have 2 cows, 2 goats and 1 sheep. 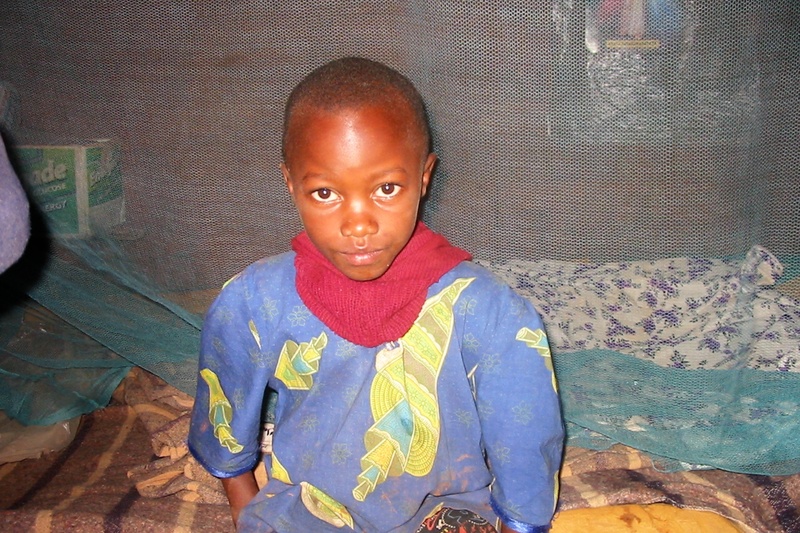 Nduku sleeps on a wooden bed with rubber straps to support her mattress of clothes and rags. She shares her bed with 1 of her sisters and they have only a blanket to cover themselves with. Her wish list includes nursery fees ($ 45 for the whole year), mattress, blankets, bedsheets, bed, clothes, shoes, uniform and food. Alexander Graham Bell Students, through Barbara Kettle, have granted her wish list. Mwendwa Mwende is 8 years old, he was born on July 2001. He is in class 2 and in his previous exam, he was position 8 out of 35 kids in his class. He lives with his 35 year old aunt and her 3 year old daughter. His uncle works in Nairobi as a driver and herbalist. The aunt is a bartender. On their 5 acre piece of land, they plant maize, beans and trees. They also have 2 chickens and 1 cow. Mwendwa sleeps on a wooden bed alone and uses old rags and clothes as a mattress. He looks healthy except for his red eyes which he says itch and water a lot, and the ringworms on his head. 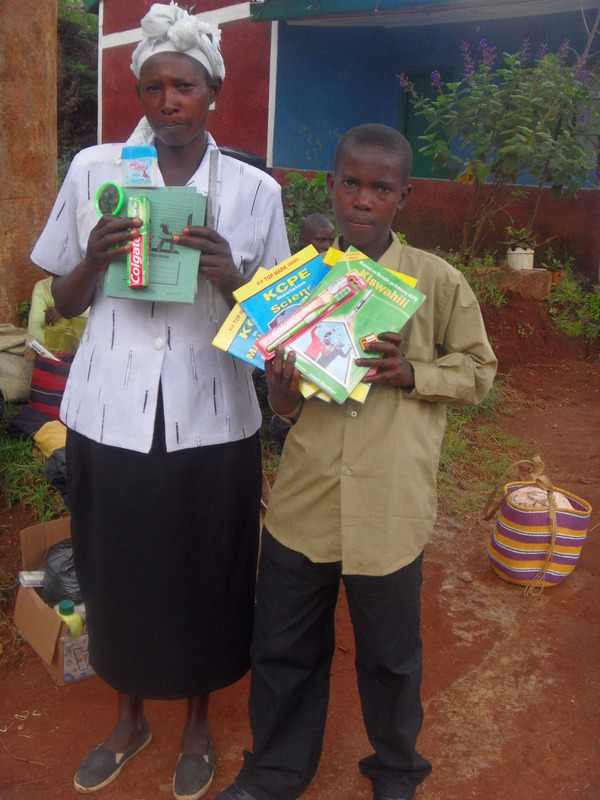 His wish list includes stationery, textbooks, uniform, clothes, mattress, food, medical care and school fees. This was granted by Jennifer Mataitis. 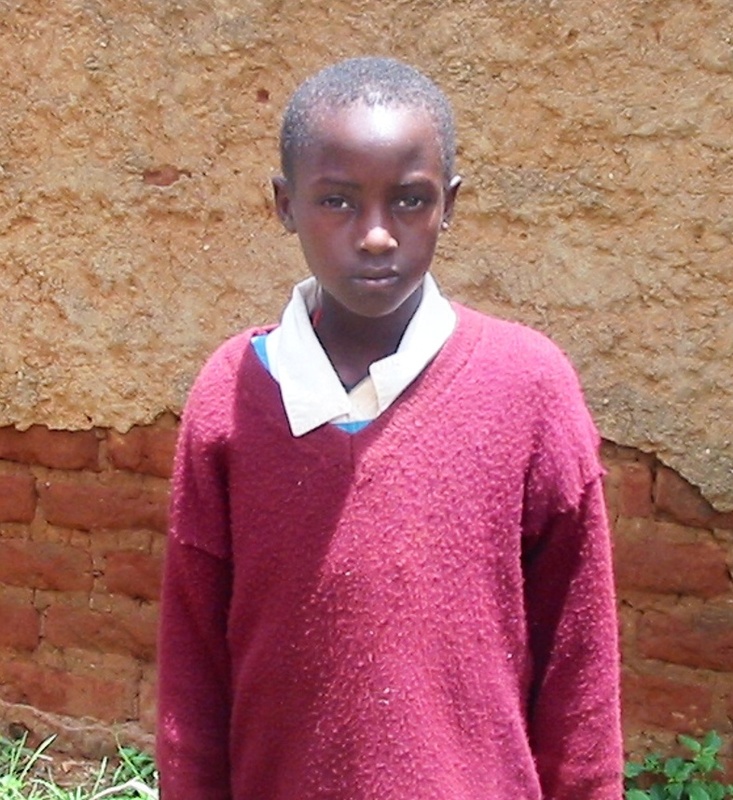 Mwongeli Mutinda is 11 years old, her exact date of birth is unknown. She is currently in standard 5 and in her last exam, she was position 6 out of 72 kids in her class. She lives with her 70+ year old grandmother and 3 siblings. Her mother passed away in 2004 after being assaulted. On their 3 acre piece of land, they plant maize, beans and peas. They also have 1 cow and 2 goats. The grandmother depends on well wishers to make ends meet. They live in a brick and iron sheet roofed house. Mwongeli shares a bed with 1 of her sisters. They sleep on the ground using sacks as a mattress and they only have an old blanket to cover themselves with. Mwongeli looks malnourished. She is thin and has light red hair – a sign of malnutrition. Her wish list includes school fees, a school uniform, food, a bed, mattress, beddings, clothes, shoes, toiletry, paraffin and a house. This was fulfilled by Fred Dawber, another ceaseless giver! 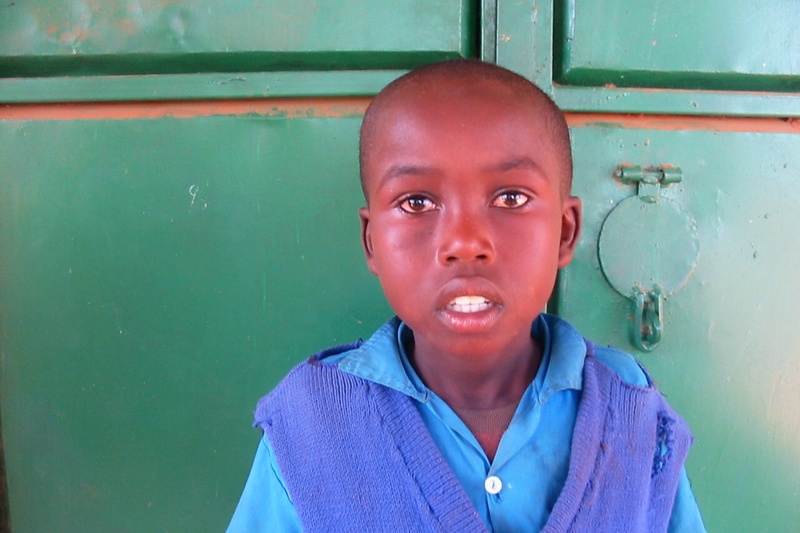 Mwendwa David now sponsored by Marc Stevens, who has also provided funds for his wish list to be granted. Mwendwa David is 11 years old, his exact date of birth is unknown. He is in standard 4 and in his last exams, he was position 34 out of 51 kids in his class. He lives with his 16 year old sister who is in standard 5. Their father passed away in 2002 from asthma and their mother in 2007 from Tuberculosis (T.B.). Their older siblings got married and moved out and left the two children alone in their parents’ house. It is only one brother who sometimes helps them out. They have a ½ acre piece of land on which they plant maize, beans and peas. They also have 4 goats. They get money through doing casual labour for other people. Sometimes, kind villagers help them out. Their house is made of mud and iron sheets which leak when it rains. Mwendwa shares a bed with his sister and they have old beddings and a torn mattress.Mwendwa’s wish list includes school uniform, clothes, medical treatment, a bed, mattress and beddings. And to close this month of enormous achievements is Stephanie MacManus, who has sponsored Mwithi Mbula, and has also granted his wish list. 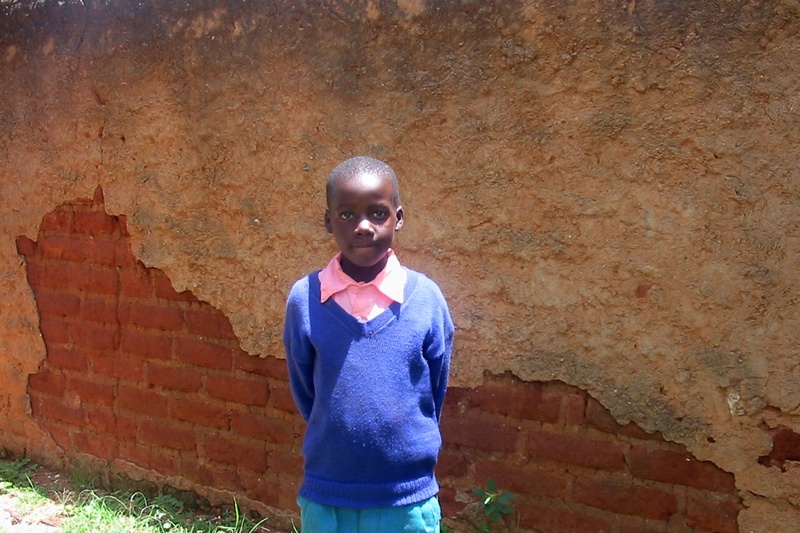 Mwithi Mbula is 8 years old, his exact date of birth is not known. He is in standard 2 and in his last exam, he was position 35 out of 59 kids in his class. His mother passed away in 2005 from Tuberculosis (T.B.). But before she died, she was chased from her matrimonial home and her husband disowned her and his son. Mwithi lives with his 60+ year old grandmother. They have a 0.1 acre piece of land and no livestock. The grandmother earns a living from depending on well wishers. Mwithi sleeps on a roughly constructed bed with a sack as a mattress and tattered beddings. He shares it with his grandmother. His wish list includes a bed, beddings, mattress, food, school fees, a school uniform, and toiletry items. All of this would not have been possible without everyone’s contribution. We all deserve a pat on the back!